To boost sales online, Clinique has come up with a Gift with Purchase promotion with Bloomingdale’s. Shoppers are entitled to an 8-piece Clinique gift set with $30 purchase of Clinique products at Bloomingdale’s. 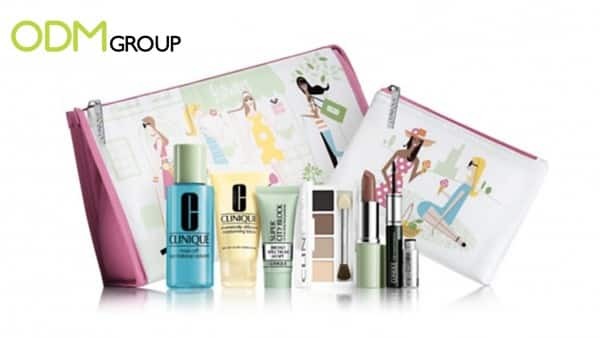 Take a look at this dainty 8-piece gift set by Clinique and read on to find out more about this online promotion! How would this promotional gift boost sales? Clinique offered items unique to their brand by giving out an 8-piece Clinique gift set which includes two pouches and six other Clinique products and make-up. This gift set would definitely be able to entice customers to purchase Clinique products with Bloomingdale’s in order to receive the gift with purchase item. Even though they may be short on the amount of $30 to receive this gift set, they may be willing to top up a little more for the entitlement. Offering useful and practical promotional gift items to customers could allow them to reuse the items instead of a one-time usage. Customers would have a higher perceived value for such practical items. This would encourage them to make purchases from your company even more. Branding is crucial in generating sales for your company in the long run. A simple imprinting of company name on your promotional item could help your business increase brand awareness to the public. Users of the cosmetic pouch are commonly women and would use this pouch even when they are out of the house. Hence, other people who come across these pouches could notice your brand name. These pouches could very well act as free walking advertisement for your company! Hurry and get your very own promotional gifts with your logo name on it for your customers!